If you’re shopping for a crossover that’s built for adventure, look no further than the new Chevrolet Equinox. This compact SUV delivers a fun ride with the fuel-efficient performance that’s great for the whole family. Read on to learn more about the 2019 Chevrolet Equinox. Whether you’re dropping the kids off at school, running errands around town, or loading the family up for a road trip, the 2019 Chevy Equinox delivers the type of performance you need. This crossover can be equipped with one of three engine choices to deliver fuel efficiency, rugged power, or a combination of both. A 170-horsepower 1.5L turbo engine comes standard and delivers 203 lb.-ft. of torque. It’s paired with a 6-speed automatic transmission to achieve an estimated 32 mpg in fuel economy on the highway. You can also opt for the available 137-horsepower turbo-diesel 4-cylinder engine that puts out a 240 lb.-ft. of torque to reach an estimated 39 mpg on the highway. If you need more power to haul gear or tow toys, choose the 252-horsepower 2.0L turbo 4-cylinder engine that delivers 260 lb.-ft. of torque and pairs with a 9-speed automatic transmission to produce a towing capacity of 3,500 lbs. when properly equipped. With the Equinox’s available switchable AWD, you can quickly shift from front-wheel drive to all-wheel drive when prompted to ensure the tires continue to grip the road in slick conditions. The Equinox boasts comfortable seating for five inside. That means everyone can find their preferred spot. You can also fold down the 60/40-split rear seat to open up 63.9 cu. ft. of cargo space to hold your luggage, camping gear, and sports equipment. You can access your favorite playlists, send and receive text messages, and use select smartphone apps on the 7” touch-screen of the Equinox’s Chevrolet Infotainment 3 System Equinox’s, thanks to Apple CarPlay™ and Android Auto™ compatibility. The Equinox is equipped with a variety of available active safety features, which can detect and help protect against potential hazards while you’re traveling. An available Safety Alert Seat delivers seat-bottom vibrations to notify you of hazards. 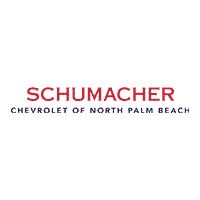 When you’re in the market for the Chevrolet Equinox, head to Schumacher Chevrolet. Our Chevy dealership in Lake Park, Florida, carries all the hottest new models.